Electa LMS is a Learning Management System for Online Courses and Online Training. Teach and train in a virtual classroom - anyone, anywhere. Electa Learning Management System is especially designed for educators, online schools, universities with online training programs and degrees, individual tutors and trainers, companies and businesses. 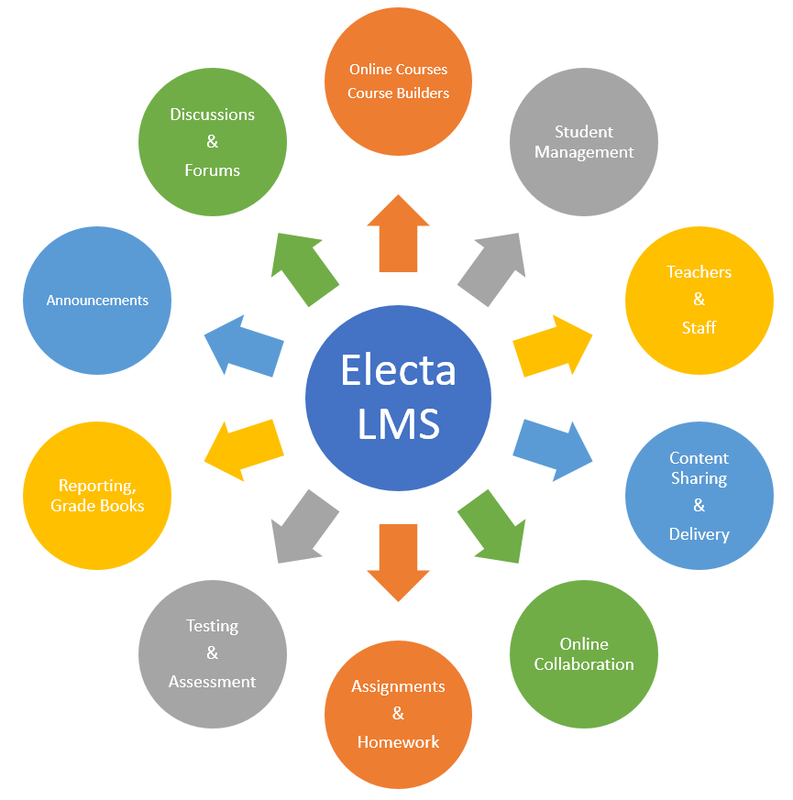 With Electa Learning Management System training organizations can deliver and manage content, handle student registrations, online course development, tracking, and assessment of student work. With Electa Learning management system instructors can deliver material to the students, administer tests, quizzes homework or assignments, track student progress, and generate grade book reports. Electa Learning Management System is not just a platform for self-paced online courses. Unlike other learning management systems, Electa LMS has got a built-in live virtual classroom software for synchronous live online training over the internet. With Electa Virtual Classroom live instruction and online meetings with students and trainees can be a part of your online courses. 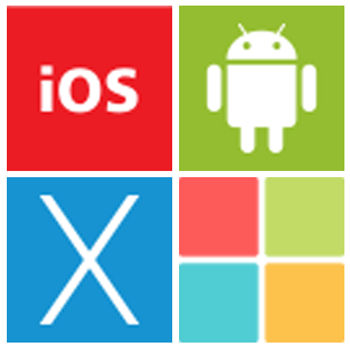 No third-party applications are needed. Your live online training sessions are a natural part of your online course resources. Online courses are even more effective for your trainees by providing hours of live instruction or orientation sessions. Find out more about Electa Virtual Classroom Software. Students and trainers can use Electa Learning Management and Online Training Software from all major mobile devices – all Android phones and tablets, iPads, iPhones. Training content can be created and accessed from phones and tablets as well as from desktop or laptop computers. All users, no matter what device they have, can access the training content at any time, from anywhere, even while travelling. Students and trainers access the learning management portal from their mobile or desktop web browsers. We have developed free apps for attending live online sessions from mobile devices. 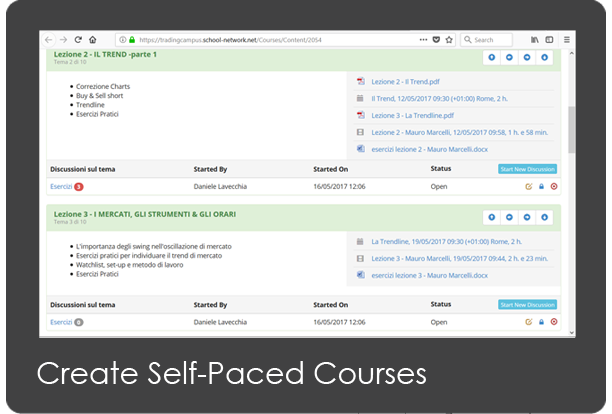 Our set of Learning Management System modules and elements allow easy course and content creation, administration, documentation, tracking and reporting. Instructors can administer tests and other assignments, track student progress, and manage record-keeping. With Electa LMS schools can deliver all forms of learning – online, blended, synchronous and asynchronous. 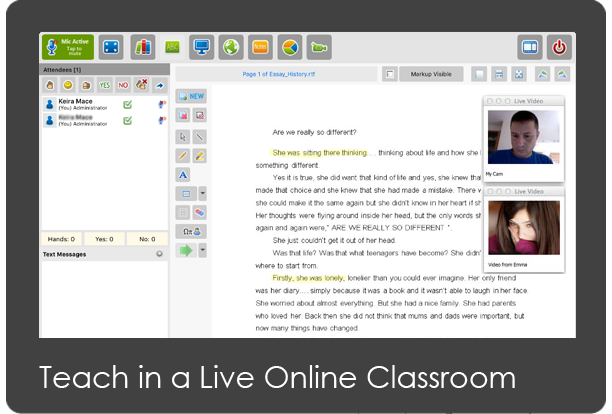 A powerful tool to create engaging online courses for your students and learners. Create simple or multi topic courses with audio, video and text lessons and multiple other different resources. Create paid courses and content. Organizations and schools usually have a variety of courses to offer to students or employees. With Electa Learning Management System courses can be logically categorized in one or more course categories. Weekly, Structured, Continuous or Timed - Deliver your learning content in the most efficient way. Choose from different course formats to provide the most effective representation to your learners. Further engage learners by initiating discussions on certain course topics or lessons. Within discussion forums, students share thoughts and review and discuss ideas. Enable self-help and support for your students. 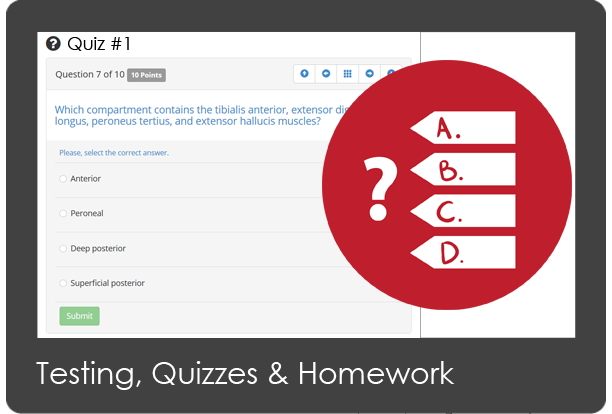 Assess your students with online quizzes and assignments. Encourage them to self-improve by giving regular homework and tasks to complete. Grading is click-easy with automatic Grade Books and custom scales. 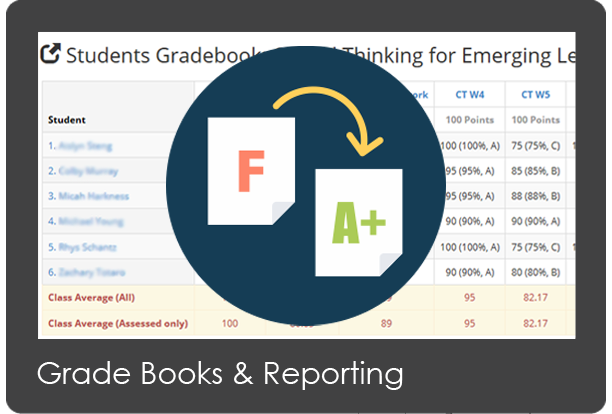 Grade books and reports are created with just a click. Results from course assignments, tests and quizzes are collected automatically to form your course grade book reports. Results are presented in percentages and grade letters. Keep your files in resource libraries, arrange files and resources into groups. Apply centralized resource management or allow instructors to build their own resource libraries. Storage is unlimited, as always. Customize your learning porta. Use your own email templates. Have your own domain name and site appearance. Benefit from multiple time zone support and several different languages. Have custom grade scales. Export and import data using common formats. Create paid content and tutorials. Sell online courses and classes to students. Get paid immediately. Use your own payment processor to accept credit card payments - Stripe, PayPal, 2Checkout, Brainetree. The Learning Management System and Virtual Classroom Software are available as monthly subscription service. We offer a cost effective and a flexible licensing model which makes Electa LMS an affordable solution for individual trainers and at the same time a powerful and a cost-effective platform for online schools and universities. A professional solution for universities and online schools and training organizations. It consists of a full-featured learning management system and multiple virtual classrooms. Handles multiple trainers and unlimited students. Cover the entire instructional cycle in your organization. Especially designed for individual trainers. This solution has one virtual classroom for one single trainer with all major Learning Management tools and modules. The package also provides an advanced scheduling system, payment collection from students and student profile management. A simple web conferencing and online meeting room for one single trainer. Basic session scheduling. This option is suitable for live online classes and web meetings, with audio, video presentation and whiteboard sharing. Electa Easy Meetings does not offer any learning management tools. To see and compare the features and tools in each configuration and check prices, please visit the virtual classrom and lms comparison page. One of our top priorities is to protect the most important elements of your business - the content and the audience. 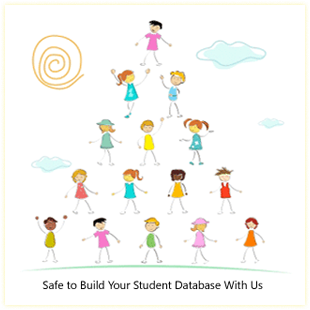 With Electa your learning content and student database are secured and kept confidentially. We at Electa do not use any shared student pools or social networking like other vendors. Your student database is not shared with your competitors. Electa LMS does not use any shared student pools or social networking approaches like other vendors. Your student database is not shared with your competitors. Electa Live products and services are fully managed and hosted. Do not worry about servers, installations, hosting, set up, etc. You focus on your business while we take care of technology. We utilize data centers located in US, Europe and Asia with perfect connectivity to every part of the world. Have your staff in India or Europe tutoring students located in US or Australia. They all enjoy supreme experience with no delays. Our cloud-based infrastructure allows us to apply no limits on usage, timing or storage, while other competitive vendors still count your megabytes and minutes. Keep as much content as needed and just forget about counting megabytes.